Compiling this for ‘In My Kitchen’ (details at the end) which I last participated in September and so really didn’t want to give this one a miss. Love Raw – got to love the collection of Manchester based company. Have enjoyed the convenient of Immunity Food Booster (tried in SOG’s soup booster leek, pumpkin and cashew soup recipe – check out why I love it). Also, very handy to have is the almond drink getting chilled in the fridge (delicious cacao and cardamom flavour). Pure Sports Nutrition – always a fan of this clean athlete brand, this time I wanted to try Hydro-Aid which is the lemon and ginger electrolyte powder drink with carbohydrate. I kept vomiting during my endurance ultra race due to nausea and want to try if consuming this makes any difference. It also claimed to helps those with morning sickness, motion sickness, and gastro. BSKT – vegan superfood bars from this Gold Coast company come in amazing flavour. I bought 2 boxes with rich, high-quality cacao and Australian ginger for extra-zingy. The added ginger from powder and dried ginger balanced well with the mixture of dates, raisin and tahini. Not too sweet, a little sourish and like the crunch of pepita seeds. Actually good for dessert and treat this like a healthy snack! Quorn – I sampled this UK product in Cape Town at the marathon expo last year and surprised how good the taste was. The sausages tasted pretty close to meat, but it made from fermented fungus and came in doughy texture called Mycoprotein. Just 20 minutes in oven and walla, high protein meal which low in saturated fat was ready. Good alternative to tofu-based products we reckoned. Sustainability-wise, this company is serious about looking after the planet. Hover over the pictures below for details and also linked to the companies. Quorn meat-free sausages made from fungus in doughy form. Hope you were off to a good start for 2018. Any detox or special diet you’ve been strictly involved in or religiously subscribe to? Love to hear. I’m all for well-balanced, healthy and making effort on plant-based and clean eating. Everything in moderation. Of course, eat (or drink) the rainbow. Happy cooking and to a great adventure in the kitchen (and out too). In a week time will be a Chinese New Year celebration in this part of the world, a good long weekend to be enjoyed. I will head over to Hong Kong for a good trail race by end of the month – the first of the year. 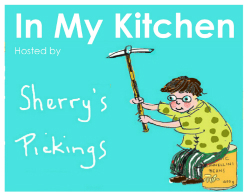 Pop by Sherry Mackay, from Sherry’s Pickings who compiled ‘In My Kitchen’ series on global virtual level by clicking the button below.